Planning to upgrade to your recruiting and hiring and onboarding process, or want to plan ahead for 2018? Attend an iRecruit demo this month! 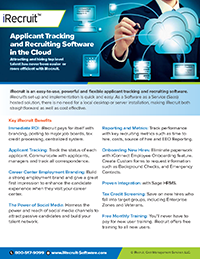 iRecruit offers a cloud-based applicant tracking, and electronic onboarding system (ATS). iRecruit is a flexible system, and you can select only the options you need! This entry was posted in Blog, iRecruit Blog and tagged applicant tracking, applicant tracking software, demo, electronic onboarding, iRecruit, webinar. Bookmark the permalink.